How to plan a good study time table ? How many hour of study per day or week ? 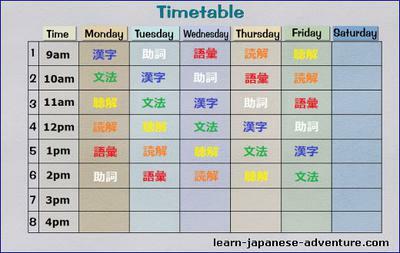 Hi JE, while it's good to have a study time table for learning Japanese, it really depends on individual. Everybody has his/her own busy schedule to meet each day. Therefore I don't think there is any fixed time table that suits everyone, whether he/she is working or studying. If you have the time, I suggest you study for 30 mins to an hour everyday. The more time you get to know the language, the more you are familiar with it, and the better you will become at it. I understand not everyone has the luxury of spending time on this everyday. But if you really have the interest in learning Japanese, you will find time for it, no matter how. I think the keys for learning any language are diligence and consistency. When I was attending my Japanese class a few years ago, I made sure I fully understood what my teacher had taught in the class. I took down notes on things I didn't understand when I was reviewing the lessons and asked my teacher in the next lesson. As such, I was always the last person who left the class because I asked many questions after the lesson. I was very lucky to have met many great teachers as sometimes even though they couldn't give me the answers on the spot, they would make the effort to do some research and let me know the answers later. I still keep this extra information given by my teachers which you cannot find in many textbooks. I also carry my electronic dictionary wherever I go, so that I can check the terms which I don't understand right away. There are many additional stuff that you can get in an electronic dictionary nowadays. So don't give up. Persevere. Learning a language is a long-term event. You need to be passionate about the language in order to continue. Most of my classmates gave up after 2 years. There is really no short cut for learning Japanese. Whether you want to learn to speak or write Japanese, commit yourself to study a little a day, and follow your schedule consistently. You may see no improvement at first, but will gain knowledge of many Japanese vocabulary and grammars in the long run. Thank you for the comprehensive reply. I am currently studying intermediate Japanese, however, I have forgotten the vocabulary & grammar learnt in the basic Japanese classes. Could you please advise how to remember those lessons that I have studied previously ? The only way to remember those lessons is to revise them. You won't be able to remember all the grammar and vocabulary if you only study them once. Revise, Revise, Revise. That's the only advice I can give.